Version 1.0.0. This tool is a PoC to demonstrate the ability of an attacker to intercept and modify insecure SMB connections, as well as compromise some secured SMB connections if credentials are known. 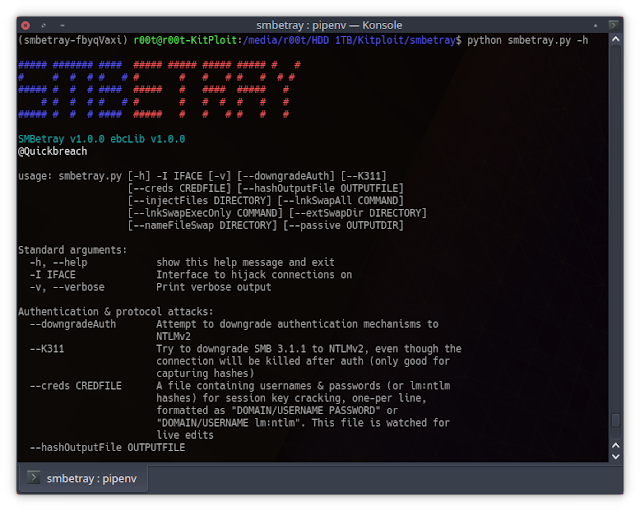 Released at Defcon26 at "SMBetray - Backdooring and Breaking Signatures"
In SMB connections, the security mechanisms protecting the integrity of the data passed between the server and the client are SMB signing and encryption. The signatures in on SMB packets when SMB signing is used are based on keys derived from information sent over the net in cleartext during the authentication phase, as well the user's password. If the password of the user is known, an attacker can re-create the SessionBaseKey and all other SMB keys and leverage them to modify SMB packets and re-sign them so that they are treated as valid and legitimate packets by the server and client. Additionally, signing is disabled by default on most everything except for domain controllers, so the need to break the signatures is rare. This goal of this tool is to switch the aim of MiTM on SMB from attacking the server through relayed connections, to attacking the client through malicious files and backdoored/replaced data when the oppertunity strikes. Finally, since encryption is rarely ever used, at the bare minimum this tool allows for the stealing of files passed in cleartext over the network - which can prove useful for system enumeration, or damaging if the data intercepted is sensitive in nature (PCI, PII, etc). More information to come - currently the tool does not support SMBv1 only connections, which is not a problem 99% of the time. The code is ugly, but it has a great personality.